Creating tables is Blogger is something that needs a bit of expertise in HTML and well as in CSS. Sometime you might want your content to be organized systematically into a tabular form aligned properly into rows and columns. Unfortunately, Blogger does not provide you tool or option to create a table for your site. However, Microsoft word has made things a lot flexible that creating a table could never be too stress-free, especially for Blogger. 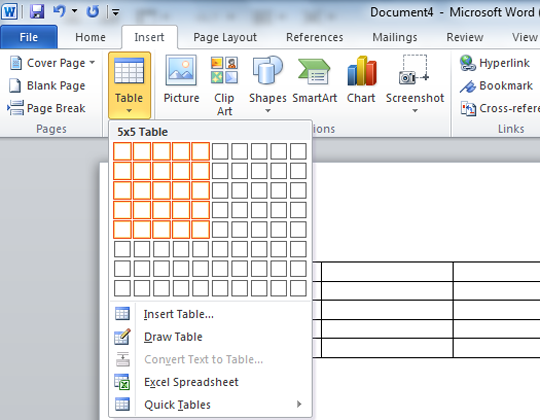 Today, in this article, we will show you How to Create Tables in Blogger using Microsoft Word. The First thing you need to do is to Download and Install Microsoft Word. If you already have this software installed then, quickly open up Microsoft Word from the start menu. Remember: You can use any version of Microsoft Word. However, in this tutorial the screenshots which we have used, are from MS Office 2010. After opening the MS Word, the next thing is to create a table. Go to Insert >> Table >> now through the table grid you can select the number of rows and columns, which you want to see in your table. For example, if you want create a 3X3 table then you have to select 3 rows and 3 columns as it can be seen in the following screenshot. Once the table is ready, you might want to give it a bit of cool and colorful look. Go to the “Design” tab and from there you can either apply the pre-designed styles or can create a new one own your own. It provides you a lot of options for customization so that you come up with a master piece. You can also increase the space between two rows and columns. Just place your cursor over a line and drag to increase the spacing between them. Now you should start filling up the empty rows and columns with your content. For better learning see the following screenshot. Once you have successfully created a table on MS Word, it’s time to get the HTML code which you will be inserting into your posts. First you need to save your document in .html extension, so go to File >> Save as and from the drop down list select “Web Page, Filtered” and press “Save” button to conclude. (Try saving the file on your desktop or so that you can access it easily). Now you have converted your table into an HTML web page, so simply go to the location where you saved the document I.e. HTML file of your table. 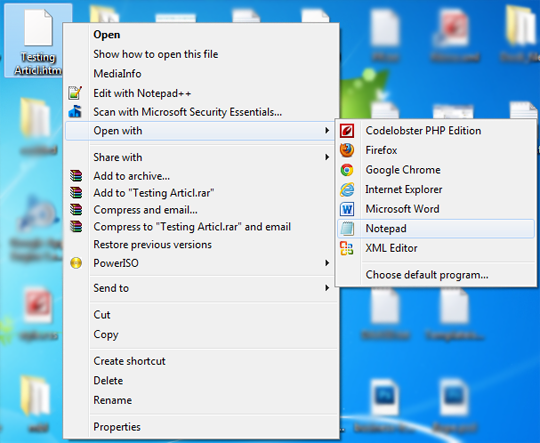 Now select the file which you saved a few moments a go and right click on it, then press “Open with >> Notepad”. 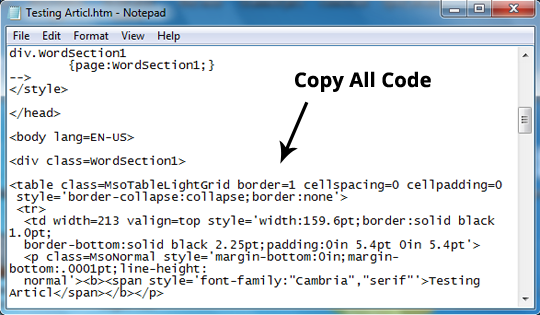 Copy all the HTML Coding present in the Notepad. Now go to Blogger.com >> your site >> Add a New Post >> Edit HTML, and now paste the HTML code in Blogger post editor which you copied a few moments ago. Once everything is done press the “Publish” button to finish the process. Congratulations: You have successfully added a table in your posts. Go visit your posts to see things are working well for you or not. Let us know what your thoughts about this fancy technique. We hope this article has helped you in learning how to easily create tables in blogger using Microsoft Word. If anyone has any better ways of doing the same job, then do let us know. If you want to ask anything, just leave it in the comment. I got lots of problem to keep table in blog. I couldn't understand the HTML codes of Table. This post help me a lot. Amazing trick for newbies! Keep it up buddy. You can directly insert table in Blogger by copying from word and pasting it in Blogger Post Editor. This post is really amazing, I've been looking for ways to add table to my blog post, but I thought it wasn't possible because I have no idea. Thanks for this Post, keep it up bro! In my next post, on www.teyusfreedomtobrowse.com am gonna implement this tutorial. New and unique one . Good job Buddy..keep it up. Try directly copying and pasting table in post. It works! Its amazing.....can we apply same method in wordpress? Nice post, its really knowledgebale and valuable, this post helps me alot thanks for sharing with us. I want to add images into a grid. I tried doing this through word and it doesn't work with the images, just text. How do we open the HTML codes when working on a Mac? Mac does not have Notepad. Hey Anna, If that case. Create your Table on Word, Don't save it. Not Select All and copy the whole and paste it on Blogger Post Composer. It would work just well. Great, thanks for such helping contents. Awesome, that helped a lot. Thanks. I have the same question as Gayle, I want to embed images into a table, but the pics don't come through. Any help would be appreciated! This is certainly not possible. Because the images you will add would not be hosted at anywhere except your own system. First you have to upload it on your blog and than simply copy paste it in your table. This post is extremely helpful and clear. I am very grateful to you. Thank you! Thanks! I got a table going in my blog! Table better than paragraphs!! I love you! I am a newbie and I need my tables to be with one column aligned to the right and one to the left, and I couldn't get this result before. It was a mess! Now it's perfect! You've made my year! I am Glad ANIA it helped you. And yes Love you too! Thanks man ! Awesome tutorial. 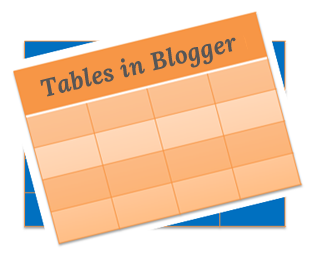 Now I can easily get tables in the blogger blog. Thanks again ! I can now sleep easily tonight! Thank you so much for this post - I have been tearing my hair out and am really most grateful to you. thanks its very easy way to create tables..
i just used this for my blog, it works fine, thanks. Thanks for share, i love this article. Thanks but i have a problem. In my table i want to insert link. I want to click on somethink in the table and transfer me in another link. Html page works fine but in blog you just see the table without links. Exactly! I simply cut-n-paste a Word table into Blogger without any HTML coding or converting. I have a table in blogger that I copy and pasted. But now I need to edit it (add cells). Is there any way to do this directly in blogger? I ve done the same way, but the table isn't responsive for mobile view. I tried to cut some words and the result it isn't really good for desktop view. Is there any code to make the table responsive on mobile and desktop view please? You can Edit it on Your Blogger Post Editor. No these are not responsive Tables. You need Responsive Tables so it looks Good on both desktop and Mobile. How to make responsive table in mobile using blogger? Thank you so much, much, much!!!! You saved my day!